"Design is not just what it looks like and how it feels. Our websites are created from scratch, using your brand as the starting point and targeting your customer. We work with you on the website content, imagery, social media and SEO. The outcome is a website that actually helps your business grow. It is vital for your company to have a solid brand & logo. The colour of the logo says a lot. Red is appetizing, blue is not. Also, the colours used around the logo when creating mail-outs & newsletters is very important. Content is important to show your future clients you are an expert in your field. Our top marketing specialist can help. We will create engaging text that will drive your customers to click on the calls-to-action. We also offer lessons on SEO & social media, or we can do it for you. We just completed the Branding and package design for DiG Leather Co.
Virginia is an uber talented home staging professional who recognizes it isn’t stuff that makes a home look appealing. Virginia’s keen eye for design allows the viewers to picture themselves in the space, by clearing away objects. Our website design for her new business conveys the strength of minimalism, while emphasizing the balance achieved through the relationship of objects and colors in space. This mobile friendly site is fully optimized, making it easy and convenient for clients to navigate. The design for her site is about creating flow, by using clear and balanced space. In a nutshell, it’s about seeing more, by having less. Is Your WordPress Website Taking TOO LONG To Load? Get more quality leads and convert them to customers. Do you want to know what pages and calls-to-action are working? You can determine what is working by the traffic and bounce rate per page, and each call-to-action. You can then adjust the website to work even better. Do you want your website to be mobile friendly? 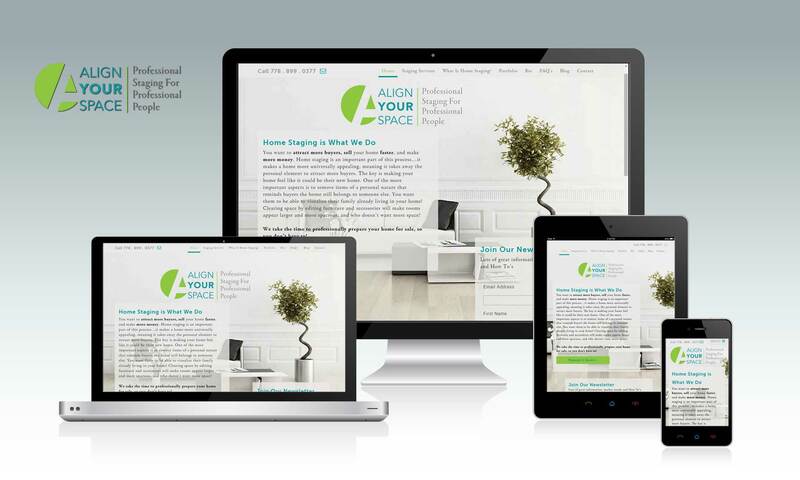 With more users choosing mobile devices and platforms your website needs to display correctly on all mobile devices. Do you want your website showing up on the first page of Google? You should be showing up on local searches with your top 10-keyword phrases.